Prime Minister Imran Khan says Pakistan will like to follow the model of China in poverty alleviation and eradication of corruption to put the country on the path of progress and development. 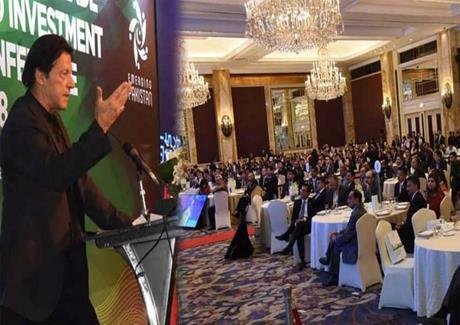 Addressing Pakistan Trade and Investment Conference 2018 in Shanghai, Prime Minister said China has progressed to great heights under visionary leadership of President Xi Jin Ping. On poverty alleviation, Prime minister said China has improved socio-economic development of seven hundred million people and get them out of abject poverty over the last thirty years. He said Pakistan will follow the model to alleviate poverty from the society by taking similar steps. He said we want Pakistani businessmen to first invest in the country. He said our government has a priority to make ease of doing business for overseas Pakistanis to make the transition back to the country. Addressing Investment Conference in Shanghai China, Foreign Minister Shah Mahmood Qureshi says CPEC will further boost up historical relationship between Pakistan and China. He said CPEC has promoted bilateral cooperation, trade and links between the two countries. He said that economic diplomacy will be given importance while forming Foreign Policy of Pakistan.